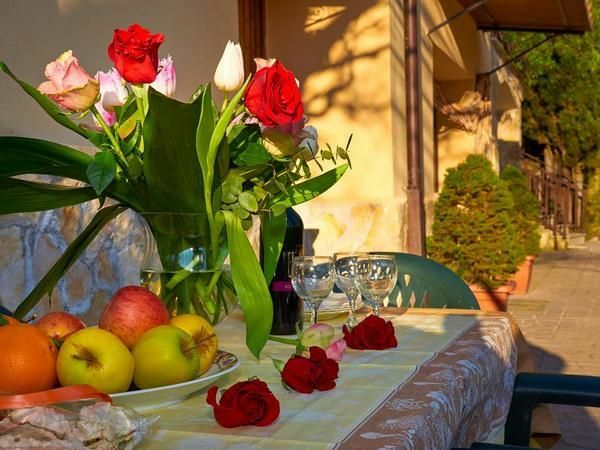 Country House Villa Pietro Romano is a rural house equipped and well integrated into the natural environment with all comforts to spend a relaxing holiday really near to Tivoli and a 30 kilometers from Rome center. The apartment "classic" is comfortable for 3 - 6 people. It has the living room, kitchen, two bathrooms, two separate bedrooms: one double room with a double bed(160x200), one bed room with one double bed(160x200), one single room (80x200) and in the loft there is one single bed (80x200). The apartment "rustic" is comfortable for 1 - 4 people. It has the living room with the kitchen and fireplace, , one bedroom with a double bed(140x200) and one bunk bed (80x200), and one bathroom. Both apartments have well equipped with all necessary for cooking kitchen, air condition, heating with pellet stove with radiators, access wifi satellite Internet. Easily reached villa is 35 minutes by car from the centre of Rome (Coliseum), 2 km from the centre of Castel Madama, 6 km from Tivoli and 2 km from the Castel Madama exit of motorway A24 Roma-L'Aquila. From the villa you can visit with a short trips the precious historical, cultural and religious sites: the Villas of Tivoli, the Monasteries of Subiaco and the Sanctuary of the Mentorella and many other sites in 30km. - Pellet fuel: per object and day Costs amounting to 5 EUR (optional). - Internet: per object and day Costs amounting to 3 EUR (optional). Pellet fuel (per property and day, included in price 5 EUR).